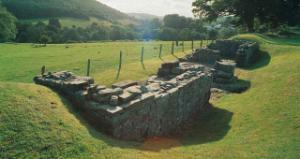 Brecon Gaer Roman Fort (Cadw)0300 025 6000work Roman RemainsThe earliest fort was built about AD 75 with defensive banks of clay which rested upon a cobbled surface. A wooden palisade would have protected the defenders. The buildings inside, one of which may have been stabling, were also constructed in wood. At this time the troops at Y Gaer included Vettonian cavalry from Spain. The earliest fort was built about AD 75 with defensive banks of clay which rested upon a cobbled surface. A wooden palisade would have protected the defenders. The buildings inside, one of which may have been stabling, were also constructed in wood. At this time the troops at Y Gaer included Vettonian cavalry from Spain. The tombstone of a young cavalryman, Candidus, has been found a mile north of the fort and is now in the Brecknock Museum, Brecon. The fort was rebuilt in stone during the second half of 2nd century AD by the men of Legion II Augusta. Open daily 10.00am - 4.00pm. Closed 24, 25, 26 December and 1 January. From Brecon take the Cradoc Road; turn left in Cradoc towards Aberyscir and then left again at the first crossroads. The site is through a farmyard at the end of the road. Please note the farm and surrounding fields are private; park with consideration and close all gates. The site is not signposted from the road.